Cursive, Night Three at The Waiting Room, Dec. 19, 2013. Night Three — the final night — of Cursive at The Waiting Room was just as packed as Night Two. Well, maybe not just as packed, but impressively crowded nonetheless. The set-up was the same as the past two shows, but the set list was firmly in “extra angst” mode. The band came on around 11 and launched into “A Gentleman Caller,” which would have its usual reprise during the encore, but I’m getting ahead of myself. The first half of the set felt dominated by odd, angular, proggy obscurities off the early releases, mixed with Gemini songs. Here’s a little secret: Though I have the records, I’m not intimately familiar with the band’s early material. Without access to a set list, my process for figuring out song names is to tap-in a specific lyric into my iPhone notepad, figuring I could look it up on the InteWeb the next morning. Hence, this morning I typed “I once had pride, I once had guts…” into the Google machine and out popped the lyrics to “A Little Song and Dance,” from the band’s second album, The Storms of Early Summer: Semantics of Song. “You lying naked next to me…” was from “Excerpts From Various Notes Strewn Around The Bedroom of April Connolly, Feb. 24, 1997” off 8 Teeth to Eat You. “What are you missing…” was “Dedication to Desertion” off the band’s first album, Such Blinding Stars for Starving Eyes. The band played with the usual panache, but seemed a bit reserved through the first half. For added effect, pre-recorded noises and sound clips played between songs — something I didn’t notice the first two nights — maybe a device to help hold the set together? While the old stuff was well received, the audience didn’t explode until the last 30 minutes of the night. The set was definitely back-loaded with gold. “The Casualty” went directly into “The Martyr,” and the crowd went nuts. 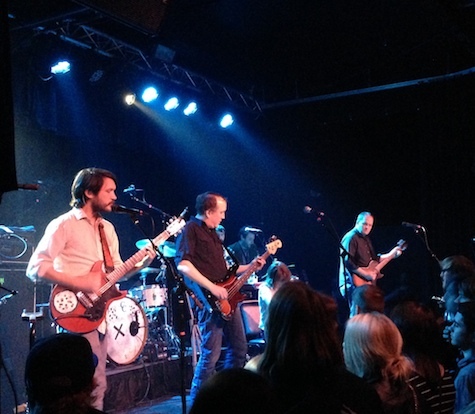 The back-to-back performance was the “arena moment” I’d been waiting for, though frontman Tim Kasher’s voice began to give out on the high-octane screams. Lovely cellist Megan Siebe (of Anniversaire) was particularly mesmerizing last night. The band needs to recruit her for the next album (if she’s willing, and who wouldn’t be?). They closed out with “Big Bang” (Chris Machmuller again joining on sax alongside trumpeter / keyboardist / Kasher wingman Patrick Newbery) and one of my all-time faves, “From the Hip” before exiting and returning for a two-song encore of “Mothership, Mothership, Do You Read Me?” (off the Burst and Bloom EP) and perennial closer “Staying Alive” sounding more bombastic than ever. Any one of the three nights of shows that comprised Cursive’s Waiting Room “residency” would make anyone’s “best shows of the year” list. All three taken as a whole is something of a landmark for local music, which (hopefully) will be documented for the ages with a live album next year. And so it ends. Or does it? Word leaked out last night that we might get two more nights of Cursive — tonight and Saturday — at O’Leaver’s, both nights also to be recorded. Scuttlebutt was that the band would announce the shows from stage last night, but they never did, which makes this a “secret show”… if it happens at all. Take your chances. 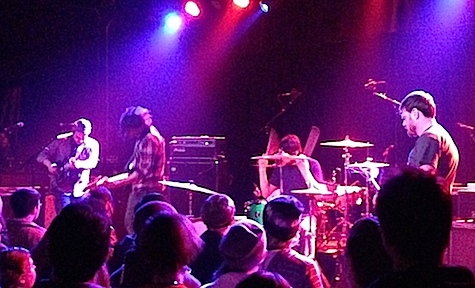 Ladyfinger at The Waiting Room, Dec. 19, 2013. Hey, what about last night’s openers? I missed Ted Stevens Unknown Project (sorry Ted), but caught all of Ladyfinger. Someone pointed out a grievous error on my part — Ladyfinger’s last album, Errant Forms, actually came out in 2013. I forgot all about it while putting together my year-end “favorites” list. Had I remembered, I likely would have included it (“The list” comes out next week, btw). Last night’s set drew heavily from that album. While the rest of the band couldn’t have been more on point — break-back rhythm section, screaming guitars — when it came time for frontman Chris Machmuller to sing the inspirational lines from “Galactic” he went into complete mumble mode. WTF! Just an off night for Mach? No. He followed it with a vocal performance on “Dark Horse” that would make Springsteen blush. So who knows. Needless to say, at the end of their short set I wanted more. I would tell you that my weekend plans are skewed by rumor of “secret” Cursive shows except that I was planning on going to O’Leaver’s this weekend anyway, starting tonight for The Seen and McCallen, Texas, band Crystal Wolf. Will Cursive also perform? Find out. $5, 9:30 p.m.
Also tonight is Barley Street Tavern’s Xmaspalooza Showcase, featuring Jeremy Mercy, Darren Keen, John Klemmensen, All Young Girls Are Machine Guns and a handful more. 9 p.m., $5. Meanwhile, down the street at The Sydney it’s Hotlines (Dereck Higgins, Amanda DeBoer Bartlett, Javid Dabistani and Luke Polipnick), with American Cream. No details, but probably $5, 9 p.m.
And for an extra-special dance treat, Darren Keen and Crew are covering Daft Punk tonight down at House of Loom. $5, 10 p.m. Tomorrow night it’s The Brigadiers with Bear Antlers at O’Leaver’s (and maybe/probably Cursive?). $5, 9:30 p.m.
Also Saturday night, The Envy Corps headlines at The Waiting Room with Oquoa and Millions of Boys. $8, 9 p.m.
Lastly, Sunday night The Mezcal Brothers headline at The Waiting Room with Matt Cox. $7, 6 p.m. I just want to say that the Oquoa show on Saturday really took me somewhere else. It was my first time seeing ’em live on a proper big stage as opposed to O’leavers twice and the Benson Block Party. Seriously, it was as close to perfect as I could imagine. I had goosebumps. This is the band of 2014; I’m calling it right now.